"Superyacht," in its last edition wrote about a medium-small helicopter, this month the subject matter will focus on a medium-large one. It is must therefore be clear that we refer to its use on a large super yacht. 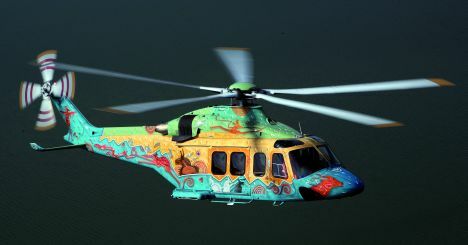 The W139 manufactured by Agusta-Westland, a company belonging to the Italian Finmeccanica Group substitutes the previous model known as the "AB, 139." The "AB" in this case stood for Agusta- Bell. The AW 139 is produced in four standard versions respectively for: medical and rescue purposes, armed forces, offshore and passenger transport. In the latter version the AW 139 can seat as many as 15 passengers plus a pilot. The "Corporate" type, instead, is geared for business purposes with an extremely comfortable seating range from 4 to 12 passengers excluding the pilots. The 3.5 cubic metre luggage compartment, the largest of its class, amply caters for its passengers' needs, especially in the 4 to 8 passenger version. The luggage sector can be reached from the cabin, and from the sides when the helicopter is grounded. The AW 139 is 16.6 metres long with an overall height of 5 metres with a maximum useful load of 2.730 kilos and a maximum take-off load of 6.4 tons. A state-of-the-art, five bladed rotor with a diameter of 13.8 metres propelled by two Pratt & Whitney PT6C-67C turbo charged engines delivering 3,350 HP at the shaft that allow it to fly at 167 knots or at 309 kph even in high and hot conditions thanks to its high play load. Full-authority digital engine controls (FADEC) and the Honeywell Primus Epic avionics system, featuring a four-axis digital autopilot and four large area flat-panel cockpit displays, add to its safety. In fact this model's strong point is its ability to fly in conditions considered before as being too taxing for passenger helicopters. Particular care was taken in reducing components which were subject to frequent changes thus reducing operational costs and maintenance hours. Both the main five bladed rotor as well as the four bladed one in the stern are high off the ground adding to passengers' safety while embarking and disembarking. 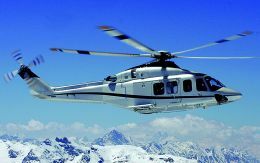 The AW139 must also be noted for its in flight low noise factor as for its upholstery and six panoramic windows ensuring greater comfort on board. 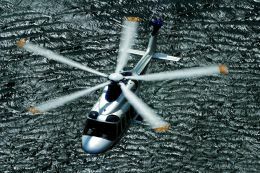 Agusta-Westland counts on this twin turbine's features and its Class A category to attract more VIPs. The class 1 standard implies that the helicopter can carry out every manoeuvre, with few operative limits, including a forced landing with only a single turbine. It also has a long 5 hour range which covers 570 miles or 1000 kms.